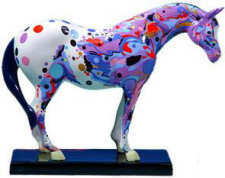 The Trail of Painted Ponies originated in Santa Fe, New Mexico in 2001 as a public art project that invited one-hundred and twenty artists to let their imaginations run wild, and creatively transform life-size fiberglass horse sculptures into original works of art. The dazzling results were displayed around the entire state of New Mexico where they were enjoyed by hundreds of thousands of people. 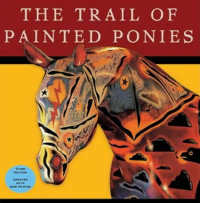 The Painted Ponies received rave reviews in the national media and were featured in a documentary film that aired on PBS stations around the country. When sold, they generated close to one million dollars for different arts, cultural, youth, animal, social and environmental organizations. What distinguished The Trail of Painted Ponies from many other animal-themed public art projects was the quality of the artwork. The horse form was created exclusively for The Trail by a nationally acclaimed sculptor. A curatorial effort was made to attract the very best established as well as emerging artists to the project. And a special outreach was made to include Native American artists. Since that time The Trail of Painted Ponies has crafted exquisite collectible-sized figurines that are replicas of the original Painted Ponies. These miniature works of art have quickly become one of the hottest selling collectibles in America. Each figurine starts as a one-of-a-kind artwork fashioned by some of the most talented painters, designers, sculptors in the US. 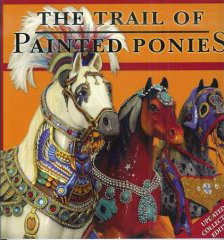 The Trail of Painted Ponies prides itself on being an authentic art project first, and a collectible company second. The figurines are meticulously crafted reproductions of original Painted Ponies. 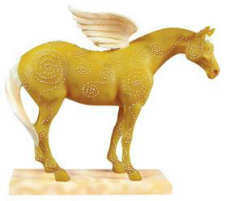 Some Painted Ponies are cast in resin and some in ceramic. There are two introductions per year the Winter Herd on December 1, and the Summer Herd, along with the Holiday Ponies, on June 1. Twice per year (January 1 and July 1) some Ponies are retired or “put them out to pasture”. The company take into account various considerations when determining which Ponies to retire such as popularity, new designs etc so often popular designs may be retired. As the range is so currently very popular newer collectors are seeking out the early retired models such as the Mosaic Appaloosa, Golden Girl, Wild Thing, etc and there is already a strong secondary market. Each Painted Pony figurine is sequentially numbered on the bottom of the base. When the number of Ponies cast reaches 10,000, the second edition is started and son on. So a Pony may be 1E (1st Edition), 2E (2nd Edition) etc. This also has a bearing on the secondary market. There is even more interest added with Autographed Editions, Exclusive Painted Ponies and a number of licensing agreements with select companies to produce Painted Pony merchandise.